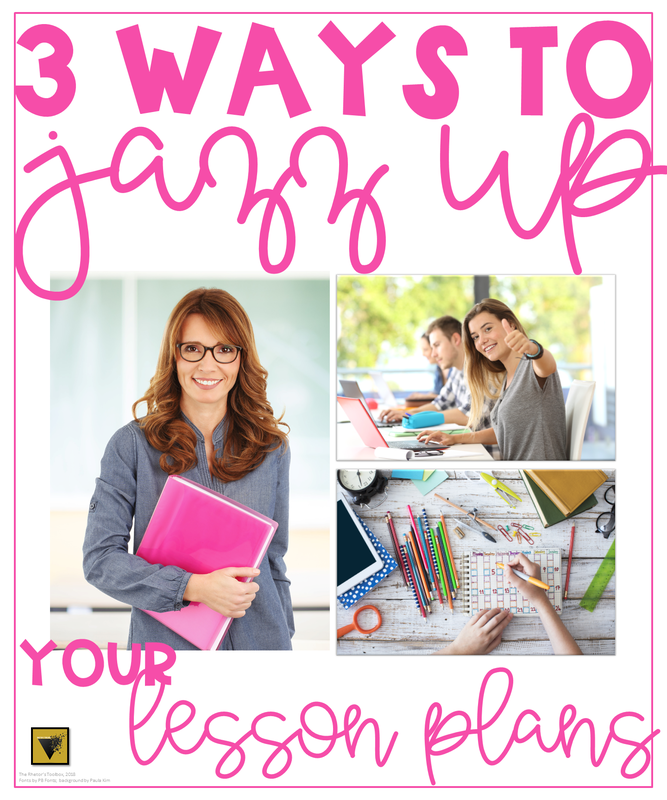 Need to add a little interest to your lesson plans? Here are three tried-and true tips for taking it up a notch. Tip #1: Always start with a personal connection. Partner/whole class discussion: What’s new? What’s good? On a half-sheet of paper, draw a quick self-portrait. Who are you right now, in this moment? Do a class temperature reading. On a scale of 1-10 (10 is the best day ever), how’s your day going? Everybody shares, but just a number–no explanation. Later in the class period or later in the day, check in with anyone under 5 who might need some extra care. Before class, spread out a wide variety of printed artistic photographs (I keep a collection of 40 in sheet protectors) on all the desks. As students walk in, ask them to browse the photographs and choose one that represents _______ (you fill in the blank based on what you want to know). When they have a photograph, they can sit down. Think/pair/share why they chose the photographs. Tip #2: Create suspense that lasts throughout the lesson. Begin with a mysterious picture and ask students to consider a conundrum that experts in the ______ field have been trying to figure out. I attended a seminar by Bryan Goodwin in which he showed several photographs of strange, changing shadows on Mars. A big room of educators was squinting at these pictures, tilting our heads in various ways, trying to figure out what was going on, when he threw in a picture of something totally unrelated. The point was that we all remembered the details of that unrelated picture an hour later because were were so engaged and intrigued. If you have desks with baskets underneath, place an object/picture/handout in each basket prior to class, and tell students to reach under their seats and take out _____ at a certain point in the lesson. When I’m feeling sassy, I do this with multiple choice packets just to mess with my AP Lang students. 🙂 It’s a fun Oprah moment. Start a question jar. Write philosophical or ethical questions related to the lesson or unit, and periodically pull a question out to spark a discussion. It’s a great Friday activity, warm-up, or end-of-class sponge when you have an extra ten minutes or a fire drill that throws off the lesson. Tip #3: Get up and move. How much do you enjoy sitting through hour-long staff meetings? Now try doing that for eight hours straight, every single day. Instantly make your class more engaging when you give your students opportunities to get up and move! Do a four-corners discussion. Label the corners Agree, Strongly Agree, Disagree, and Strongly Disagree. Give students a statement, have them move to the corner that represents their feelings about the statement, and give them time to discuss. Have each corner share out and debate back and forth. You might even have students switch corners (ask them why!). Instead of a lecture, jigsaw the information and have “expert” student groups make posters to teach the concept, then have students to a gallery walk and take notes/fill in a graphic organizer. Have students write/act out skits. Use pre-set partners and groups that require movement. I like to use Fractal Groups (I set this up in my introductory unit), where students have pre-determined partners that they have to get up and talk to when I direct (it’s easy to do this on the fly as well as when I plan for it). Give one, get one. After students have completed a brainstorming or review activity, have them Give One, Get One. They must spend X amount of time out of their seats, moving around the room and talking to X number of peers. They should share their thinking and “give” one item to a peer to write down, then “get” one item from a peer to add to their own paper. There are so many low-prep ways to make your lessons exciting and intriguing! I’d love to hear some of your strategies in the comments.